We're proud to partner with two outstanding, local, well-known teaching professionals who offer private and semi-private lessons at our facility. Call the Pro Shop at 905-641-8088 for more information or to request a referral. After a successful business career in banking and consulting, Doug began his career in the golf industry in 1998 with Brock Golf Course, when it was known as The Greens At Brock. Joining the CGTF in 2006 and achieving his Level IV certification in 2007, Doug now serves Niagara as a qualified Master Teaching Professional. Doug’s teaching philosophy centers around the fundamentals of the swing, being grip, alignment, stance, posture and positions of the golf ball. It is his belief that without these basics in place, one cannot begin to make a proper golf swing. Working with beginners to low handicappers, Doug ensures these fundamentals are part of each students' own swing. Natural position and movement is everything. The ‘short game’ is a critical part of Doug’s instruction. Putting, chipping, pitching, and sand play are such an important part of the game that Doug encourages students to spend 2/3 of their practice time on these skills. 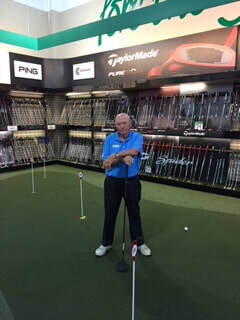 John has been teaching the game of golf for nearly 40 years, studying and honing his craft to be one of the top teachers in the world. Having taught multiple champions of all ages, he is dedicated to getting the most out of your ability. Visit John in his NEW indoor Learning Centre in the lower level of our clubhouse.